The regular readers of this blog know that I’m old-fashioned. I still use stamps to send birthday cards, hand-written letters, and thank you notes. I’ve written a few blog posts about the dying art. 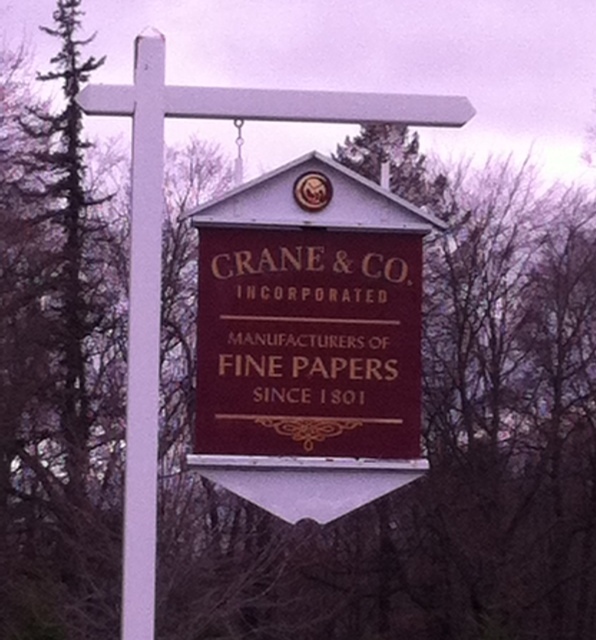 When I took a trip to the Edith Wharton estate in Lenox, Massachusetts, I also included a stop in Dalton at Crane & Company. Paper and writing is in my blood. A quick look at my watch, however, tells me that there are only about 58 hours until happy cooks start delivering their dishes to Chummy’s Midtown Diner for The Moxie Recipe Contest. Writing hand-written thank you notes will have to wait until after the contest; that doesn’t mean I can’t say “merci” here on the blog. First, thank you to my wonderful hometown, Lisbon, Maine, and the members of The Moxie Festival Committee. When I first suggested having the recipe contest on Friday instead of Saturday, I wasn’t sure it was going to fly. After thoughtful consideration, everyone gave their approval and they’ve been cheering me along the whole way. Second, here’s a very special “thank you” to everyone at Chummy’s Midtown Diner. Owner Ben Berry has been patient and kind throughout this whole ordeal; he’s never once said “no, that won’t do.” Please go out and “like” Chummy’s Mid Town Diner on Facebook this instant! I’ve made some new friends along the way, like Deb Wagner. Deb is not only the “official” chair of the 2013 Moxie Festival, she also does all the publicity and marketing for the event. She took the “wicked good” picture of me mixing up some Moxie and she’s sent me lots of encouragement, too. If I ever write a book, I’ll put the picture she took on the back cover and of course, I’ll give her all the credit. My old baton-twirling friend, Gina Crafts Mason, has been especially helpful to me along the way. Through her giant Rolodex of contacts, she produced contest judges (Linda Bean and Shannon Bissonnette), products for the swag bags (Raye’s Mustard and Moxie Jelly), and even donated Moxie aprons for contest winners, courtesy of her family’s business, Rick Mason Excavation, Inc. I’m going to find that picture of Gina and me marching in a parade in the early 1970’s and then we’ll have evidence that she has been a parade planner from way back. Asking for help is not my strong suit; I often toil away stoically instead of picking up the phone and saying “would you like to donate” or “can you help me with this?” That’s why it was so important that the very first business I asked to donate a prize for the recipe contest, Now You’re Cooking, in Bath, Maine, said “yes” in a big way. Amy Bouchard, of Wicked Whoopies, agreed to be a judge in about ten minutes back in February and she also donated some of her Classic Whoopies for the swag bags. One day, I happened to be driving by her factory in Gardiner, Maine. I walked right in and even though she didn’t know me at all, we sat down in her office and had a long chat about small businesses, life, and cooking. She even gave me a hug when I left. Feeling confident, I stopped by an antique shop at home, The White Dresser, located at 501 Lisbon Road in Lisbon Falls. It’s amazing and serendipitous that the owner, Karen Crafts, just happened to have a set of Pyrex nesting bowls to offer as a prize. As I’ve gotten to know Karen better from shopping at her store, methinks she may have gone out of her way a little bit to find this perfect prize. Please go out to Facebook and “like” The White Dresser this instant. Being from a small town where “everyone knows my name” is helpful when I ask someone I’ve never met for a prize donation. Sure, Bauer Street intersects with Woodland Avenue and I’ve walked by the Bauer family home a million times in my life, but I’ve never met Peg Bauer, Pampered Chef Consultant, in person. That’s why it was particularly thoughtful when she responded to my request for a Pampered Chef prize basket with a very prompt “of course.” She even threw in 25 orange peelers for the swag bags. Another former neighbor, who grew up on the other corner of Bauer Street, has a kettle corn business, MAC’s Kettle Corn. Not only did Janice and Moe agree to pop up a special batch of their delicious product for the swag bags, they even delivered it to my parents’ house. They don’t know this, but I often buy a big bag of their kettle corn when I gas up my Jeep at J&S Oil in Topsham. This kettle corn has kept me crunching and awake on many late night rides home on the Maine Turnpike. I’ve never once found an unpopped kernel in the bag, either. Did I mention one of my judges, The Yankee Chef? Jim Bailey has been helpful in so many ways and he’s promoted the contest in his own cooking travels. Would you believe we’re practically related through six degrees of AYUH? Yup, he knows my friend Audrey, who I happened to pass on the Maine Turnpike the other day. Thank you to all my family and friends, and especially my Facebook friends who have suffered through months of Moxie posts from me. They’ve humored me, helped me, and some of them have even entered The Recipe Contest! When I was afraid no one would enter the contest, my friend Shelley was the first one to commit her cooking. I can’t tell you what she’s making yet, other than it’s not her Chicken Tetrazzini, which I know she could handily “Moxify” for next year. Thank you to Katie at the Dairy Maid whose smile and “can do” friendly personality is always a bright spot in any busy day of running the Moxie roads. She’s gotten a few of her family members to enter the recipe contest, too. The ice cream at the Dairy Maid will be “orange pineapple” for the duration of the Moxie Festival. I couldn’t help but wipe a little tear from the corner of my eye, but then you knew I would say that, didn’t you? I know I’m forgetting a lot of people, and in the course of the now remaining 56 hours the list will grow. Don’t worry, I will remember everyone eventually and then I’ll write a blog post about it. Like my friends from The Big Corporation who are driving hundreds of miles to attend the recipe contest or run in the Moxie 5K, or my friends from the Class of 1982 who are helping me in the snack shack for The Moxie Car Show. Speaking of which, I’ve got to get my motor running right now and start mixing up a dish to prepare tomorrow morning at 8:30 a.m. on Fox 23’s local Tee Vee show, Good Day Maine. Thank you, my blog friends, for reading my longest blog post ever! This entry was posted in You've Got Moxie! and tagged I love Lisbon Falls, keep it local, No gardening post for Reggie today, small town living, The Moxie Festival Recipe Contest, writing thank you notes. Bookmark the permalink. No gardening post, but a well-deserved one for all your Moxie supporters. Why, thank you, King Reginald! We will get back to gardening next week. I think switching the recipe contest to Friday night was a fabulous idea! I’ve wanted to enter for several years and this year I am finally doing it. See you Friday ! I appreciate the feedback and I’m glad you will be able to join us Friday night! Thanks for stopping by the blog, Dawn, and good luck to you! Moxie cheers to you my friend, great job on the recipe contest, you have brought it to the next level! See you Friday night! I can’t wait to put on my Moxie “Official” polo shirt; I’m honored to be part of such a wonderful team! Thank you for all your help, Gina. Remind me to write a blog post about Garrett “carrying the mustard” for the Moxie Party!